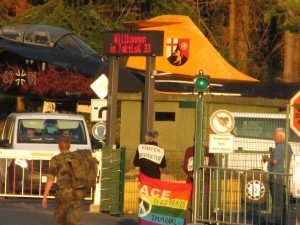 BÜCHEL, Germany — Two US citizens calling themselves “Weapons Inspectors” were detained Monday, August 6 after they gained access to the Büchel Air Force Base, a reported deployment site for 20 US nuclear weapons nearby. Monday was the 73rd anniversary of the US atomic bombing of Hiroshima, Japan. 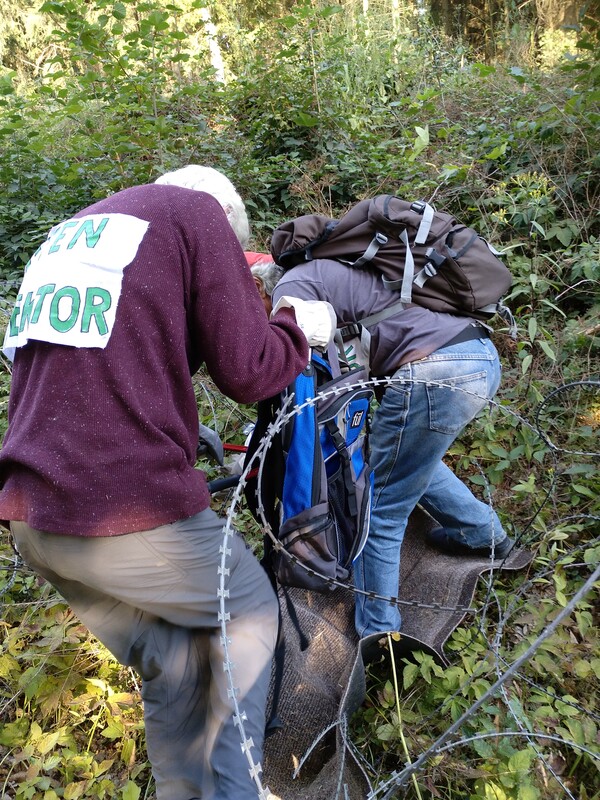 The two, Susan Crane, 74, from the Redwood City, California Catholic Worker, and John LaForge, 62, from the group Nukewatch in Wisconsin, clipped through exterior fencing and NATO wire around 5:30 p.m. to gain access to the inner security area of the base. “Nuclear weapons are immoral and illegal because they indiscriminately kill everything in their wake,” said Crane. “Their effects, the fires and radiation, can’t be controlled in any way, so any use of them violates the rules of war,” she said. LaForge added, “Any deployment of US nuclear weapons in Germany also violates the Nonproliferation Treaty which prohibits any transfer of nuclear weapons between parties to the treaty.” “The NPT also requires signatories like the US and Germany to pursue negotiations for nuclear disarmament, like the recently adopted Treaty on the Prohibition of Nuclear Weapons of July 7, 2017,” he said. “We hoped to confirm that the US has removed its nuclear bombs in compliance with the Nuclear Nonproliferation Treaty, but our investigation was halted by the military,” Crane said. Once inside, the two located several “protected airplane shelters” surrounded by another barrier of NATO wire, and they spent one hour on top of one shelter to take radiation measurements. After climbing down to inspect a second bunker, the two were observed and detained by a large number of military personnel. “The extra razor wire around the bunker, the near access to the jet runway, and the massive heavily armed military reaction to us, indicates the US nuclear weapons are here,” Crane said. Nuclear weapons experts including Hans Kristensen of the Federation of American Scientists, have reported that the highly secure shelters in this area of the base contain underground “vaults” capable of holding the US B61 gravity bombs. Crane and LaForge noted the national security threat of wild fires in Germany brought on by record-breaking heat and drought. “The German government continues wasteful training missions for nuclear war here, and intends to spend billions on a new Eurofighter, while the country had no planes available 12 days ago for fire suppression efforts in the eastern part of Germany” (as Annalena Baerbock, the head of the Greens in the state of Brandenburg, said in a television interview August 5). The US activists wore signs reading “Weapons Inspector,” and searched part of the base with a radiation monitor for signs of nuclear weapons deployment. The two were eventually observed, detained, and kept face down in the grass for an hour. After being searched, identified, and turned over to local police, they were released without conditions around 20:45 p.m. The Hiroshima Day inspection came toward the end of a 20-week-long series of protests which began March 26, organized by “Büchel is Everywhere: Nuclear Weapons-Free Now!”, a nation-wide coalition of 50 peace and justice groups and organizations working for nuclear disarmament. The campaign’s three goals are removal of all nuclear weapons from Germany, cancellation of plans to replace the B61s with new weapons, and Germany’s ratification of the new Treaty on the Prohibition of Nuclear Weapons. In Scotland, at 6:55 a.m. on August 7, three anti-nuclear campaigners blockaded the access road leading to the South entrance to Faslane Naval Base on the Clyde, aiming to blockade the entrance until 9 a.m. when the gate was scheduled to close. They did so to mark the 73rd anniversaries of the Hiroshima and Nagasaki bombings on August 6 and 9. This action followed on from a special vigil at the North entrance the day before, during which we projected audio recordings of A-bomb survivor testimonies into the base. We were fortunate enough to host a survivor of Hiroshima at the peace camp the previous week, reminding us all of why we must continue to fight to ensure such acts can never happen again. Shortly into the blockade, the MOD police decided to close off the road, redirecting traffic along the A814 towards the North Gate of the base. This created a tailback of traffic along the A814, and delays for anyone caught in the traffic. Much like the tailbacks created by the Scottish Water roadworks in Rhu (which frequently reach the peace camp, 3 miles away), the traffic on the double-laned road was controlled and kept safe by both MOD Police and Police Scotland. The MOD cutting team removed the campaigners from the road – all were removed and arrested by 11 a.m. They were each charged with “breach of the peace” – our favourite ironic charge. 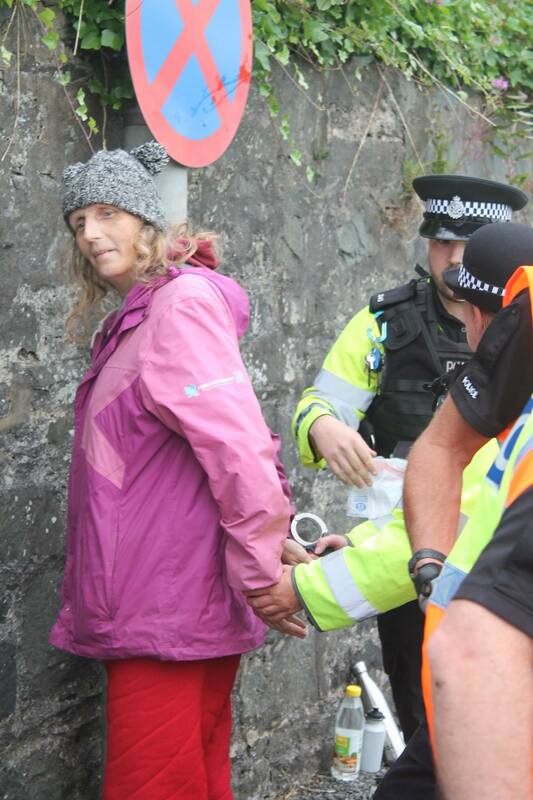 Update: Two of those arrested campaigners were later released, pending court later in the month. The third has refused bail and remains in police custody. On Monday August 6, 2018, a little over 30 people gathered at the main entrance to Vandenberg Air Force Base in California to commemorate the 73rd anniversary of the bombing of Hiroshima by the United States. Vandenberg is the location of our country’s testing of I.C.B.M.s, one of the delivery systems for nuclear warheads. The peaceful vigil included readings from John Hersey’s “Hiroshima”, a nuclear abolitionist statement by Archbishop Raymond Hunthausen, and the Prayer of St. Francis. Seven vigilers held pictures of the seven Kings Bay protesters as an invitation for them to be present with us. 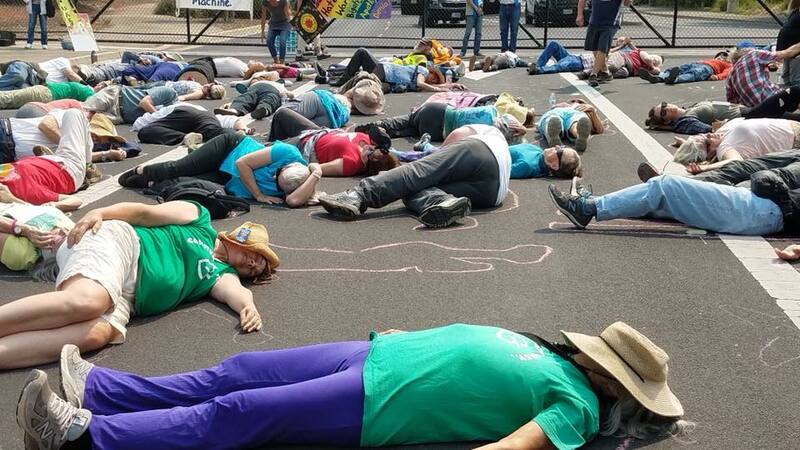 Tensie Hernandez of the Guadalupe Catholic Worker chose to represent the group with an act of civil resistance. She walked onto the Base and refused to leave, talking with security police regarding the bombing of Hiroshima and the importance of being intentional about our life decisions and who we choose to support. She was arrested, handcuffed, cited for trespassing, driven off-base and released. She will be notified of her court date. 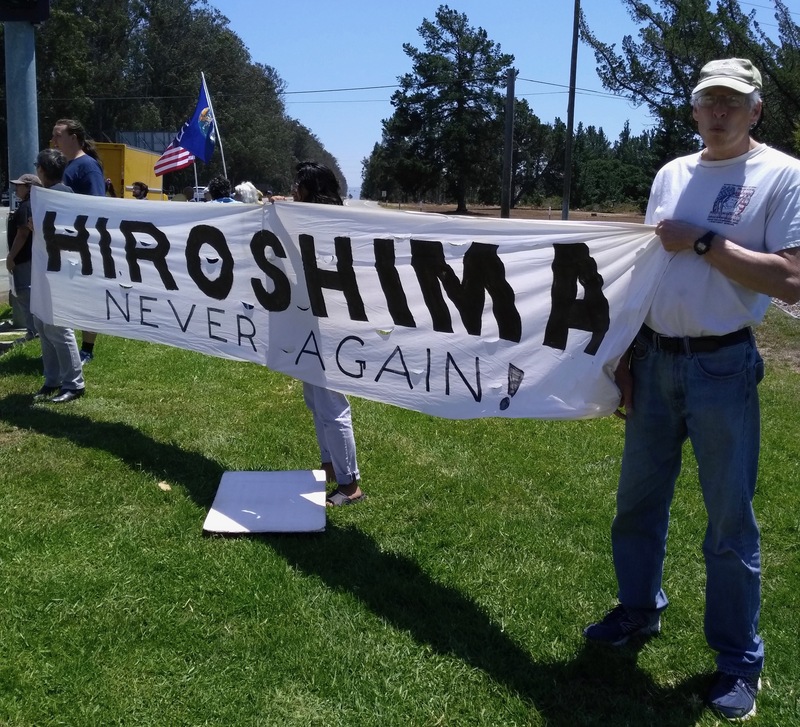 On August 6, the anniversary of the United States dropping the atomic bomb on Hiroshima, Japan, activists in the San Francisco Bay area gathered for a March for Nuclear Abolition and Global Survival at the Lawerence Livermore Nuclear Weapons Laboratory. They gathered at Livermore Lab to demand a stop to the creation of new and “more usable” nuclear weapons proposed by President Trump in his Nuclear Posture Review and fiscal 2019 budget, both released this year. 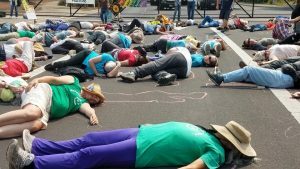 Following a rally with speakers including Jackie Cabasso, Marylia Kelly, Daniel Ellsberg and Joanna Macy, many of those in attendance had a die-in in the street. Afterwards, 41 people crossed onto lab property and were arrested. Over 86% of this year’s lab budget is exclusively for nuclear weapons development. Article in the People’s World here. On Monday morning, August 6, Catholic Worker Fr. Jim Murphy was arrested after crossing the line at the Kenney Gate entrance to STRATCOM at Offutt Air Force Base in Bellevue, Nebraska. 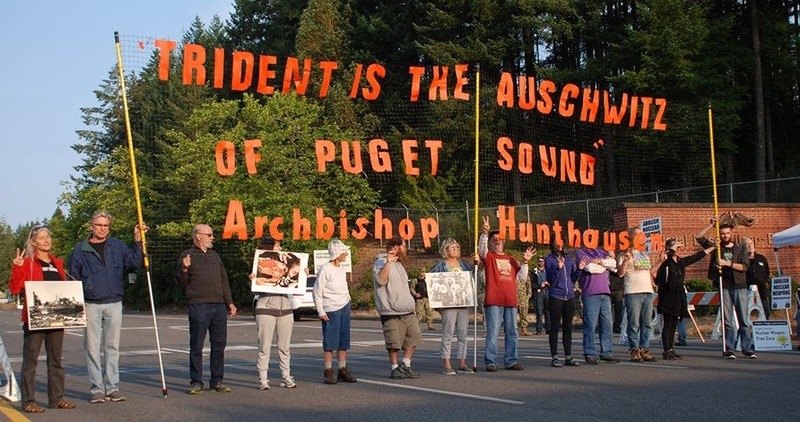 Fifteen nuclear abolition activists and Catholic Workers were gathered on that day in remembrance of the US atomic bombings of Hiroshima and Nagasaki, Japan on August 6 and 9, 1945. Fr. Murphy is the pastor at Saints Anthony and Philip Church in Highland, Wisconsin and Saint Thomas Church in Montfort, Wisconsin. Supporters note that it’s possible he will receive a prison sentence because he has been arrested there before. Members of the Des Moines Catholic Worker and other activists started a three-day vigil outside St. Ambrose Cathedral in Des Moines – starting on the August 6 anniversary of the U.S. atomic bombing of Hiroshima and going through the August 9 anniversary of the U.S. atomic bombing of Nagasaki. With their banners, flyers and sidewalk speak-outs, they implored Bishop Richard Pates to speak out against the Iowa National Guard Drone Command Center in the city. Upon conclusion of their Cathedral vigil on August 9, a small group went to the Drone Command Center, where Frank Cordaro and Jakob Whitson attempted to enter in protest. They were arrested for trespass and released with a citation and initial court date. from Dorothy Day Catholic Worker, Washington, D.C.
On August 6, from 7 – 8 a.m., about 20 people from the faith-based peace community in D.C., Virginia and Maryland, held a prayer witness of repentance at the Pentagon to commemorate the 73rd anniversary of the U.S. nuclear bombing of Hiroshima and to call for the abolition of nuclear weapons. (See Prayer Service Program of Repentance below) This witness was organized by the Dorothy Day Catholic Worker and cosponsored by Pax Christi Metro-DC, and Pax Christi USA, Pax Christi International, Columban Center for Advocacy and Outreach, Assisi Community, Jonah House, Maryknoll Office for Global Concerns, the Sisters of Mercy—Institute Justice Team and the Franciscan Action Network. We gathered for the Prayer Service in the Pentagon police-designated-protest-zone, which is located in an enclosed space behind a bicycle fence on the southeast corner of the Pentagon near the south parking lot. As hundreds of civilian and military workers streamed into the Pentagon, they saw several prominent messages that were displayed on a sign and banner: “U.S. Nuclear Bombing of Hiroshima, August, 6, 1945—Repent,” and: “Remembering the Pain, Repenting the Sin, Reclaiming the Future—Aug. 6-9 Hiroshima & Nagasaki.” The banner also depicted a drawing of an A-Bomb child victim. Vigilers also held photos of victims of Hiroshima and other signs. 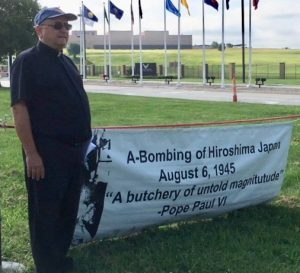 After the second paragaph of the Apology petition was read by Kathy Boylan, she proceeded to walk out onto the sidewalk toward the entrance to the Pentagon, holding a banner that said: “Hiroshima and Nagasaki: A Butchery of Untold Magnitude”—Pope Paul VI). Kathy was met by Pentagon police and shortly thereafter was handcuffed and taken by Pentagon police to be processed and released. She was charged with “interfering with agency functions,” and “failure to obey a lawful order,” and given a September 20, 2018 court date. At the conclusion of the prayer service, we had a closing circle which included a short reflection from Shizuko, a Japanese peace activist who shared about the bombing of Hiroshima and its aftermath, as well as a powerful encounter an A-bomb child had with a U.S. Airman who was involved in the bombing. To commemorate the U.S. nuclear bombing of Nagasaki and to call for the abolition of all nuclear weapons, please join us on Thursday, August 9th from Noon – 1:00 p.m. There will be a Prayer Service of Repentance outside the White House. Meet on north side of White House on Pennsylvania Ave.–across from Lafayette Park. During our Prayer Service of Repentance in front of the White House on August 6, 2016, an Apology Petition was read and presented to Mr. Mimaki, a Hiroshima A-bomb survivor. Over 700 people signed the petition. In September 2016, Mr. Mimaki delivered the petition to the Mayor of Hiroshima and it is now at the Hiroshima Peace Museum. This petition was prepared by Scott Wright and Art Laffin. Groups sponsoring the petition include: Dorothy Day Catholic Worker, Pax Christi Metro-DC, Columban Center for Advocacy and Outreach, the Sisters of Mercy—Institute Justice Team, Little Friends for Peace and Jonah House. Let us pray that we can truly listen to Jesus and be transfigured by God’s love. Let us renounce what Dr. King called the triple evils of poverty, racism and militarism as we seek to follow the way of nonviolence and create the Beloved Community. I come and stand at every door, But no one hears my silent prayer, I knock and yet remain unseen, For I am dead, for I am dead. I’m only seven although I died, In Hiroshima long ago. I’m seven now as I was then, When children die they do not grow. I need no fruit, I need no rice, I need no sweets nor even bread, I ask for nothing for myself, For I am dead, for I am dead. All that I ask is that for peace, You work today, you work today, So that the children of this world, May live and grow and laugh and play. Good morning. On behalf of the Dorothy Day Catholic Worker and all other peacemakers present here, we extend greetings of peace to everyone at the Pentagon today. Seventy-three years ago, on August 6, 1945, the U.S. ushered in the Nuclear Age by committing the unspeakable act of using nuclear weapons against the people of Hiroshima. Three days later, on August 9, the U.S. used a second nuclear weapon against the people of Nagasaki. Over 200,000 Japanese died in these bombings and many thousands more have suffered and died since from the effects of nuclear radiation. The U.S. has never repented for the use of these weapons of indiscriminate mass murder. We, members of the Dorothy Day Catholic Worker, Pax Christi Metro-DC, and Pax Christi USA, Columban Center for Advocacy and Outreach, Maryknoll Office for Global Concerns, the Sisters of Mercy—Institute Justice Team, Jonah House, the Assisi Community and the Franciscan Action Network come to the Pentagon today to say Yes to the God of Life who commands us to love and not to kill, and No to the forces of evil, death and destruction. As people of faith, we stand here in front of the Pentagon with contrite hearts as we call on our nation to join with us in repenting for the colossal sin and crime of building and using nuclear weapons, to apologize to the Japanese and A-Bomb survivors (known as Hibakusha) for our country’s use of the bomb against them, and to demand an end to ongoing immoral nuclear war preparations. We also join with people of faith and conscience committed to nuclear disarmament worldwide and here in the U.S., many of whom are holding peace and resistance actions during this time of commemoration, including peacemakers at Los Alamos and Livermore Nuclear Labs, the Bangor nuclear submarine base, the Brandywine Peace Community who are acting at Lockheed Martin, and the Manhattan Project for a Nuclear Free Future. We remember, too, the ICAN-sponsored global fast for nuclear disarmament. 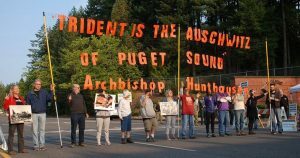 And we lift up in a special way the witness of the Kings Bay Plowshares, seven Catholic peace activists who carried out a plowshares action at the Kings Bay Trident facility in St. Mary’s, Georgia on April 4, 2018. Three of the seven are still being held in pre-trial detention and the four remain under house arrest as they await their trial. Nuclear weapons were conceived of, built and used under a shroud of secrecy and deception. Since the Manhattan Project to create the Bomb began in 1940, the U.S. has spent some $10 trillion building and refining its nuclear arsenal. Instead of leading the world toward nuclear abolition, the U.S. continues to build even deadlier weapons. And it is also using nuclear technology in its efforts to militarize and dominate space. The violence unleashed at Hiroshima set in motion a trajectory of unrelenting violence by the U.S. in its wars of aggression that it has waged over the last seven decades, claiming untold lives. Today the U.S. government possesses about 6,500 nuclear weapons, many of which are on hair-trigger alert, and proposes to spend an estimated $1 trillion over the next 30 years to modernize it’s existing nuclear arsenal. This deadly venture not only endangers all of creation but is a direct theft from the poor of our nation and world. The Bulletin of the Atomic Scientists has turned its “Doomsday Clock” to two minutes before midnight to signify the perilous situation facing the world due to the dangers of nuclear war and the climate crisis. This peril has been exacerbated by an unstable U.S. president who has threatened to attack North Korea and Iran. As a leading nuclear superpower, the U.S. practices a double standard by calling on other nations to disarm while, at the same time, it refuses to disarm and instead is rapidly expanding its own nuclear arsenal. If the U.S. is to ever truly lead the way to real disarmament, it must first repent for the nuclear bombings of Hiroshima and Nagasaki and endorse and ratify the historic UN Treaty to Prohibit Nuclear Weapons. Only then can the U.S legitimately ask other nuclear nations to disarm. Pope Francis declared: “If we also take into account the risk of an accidental detonation as a result of error of any kind, the threat of their use, as well as their very possession, is to be firmly condemned…The total elimination of nuclear weapons is “both a challenge and a moral and humanitarian imperative” of our time. Now is the time for urgent nonviolent action to abolish nuclear weapons, killer drones and all weapons, and to end the scourge of war. If the human family and the earth are to survive, we need to heed the admonitions of the Hibakusha, Pope Francis, Gandhi, King, Merton, Dorothy Day, the Berrigan’s, Archbishop Hunthausen and many other prophets of peace. We need to strive with every fiber of our being to embrace the way of nonviolence, pursue the path of just peace and create the Beloved Community.